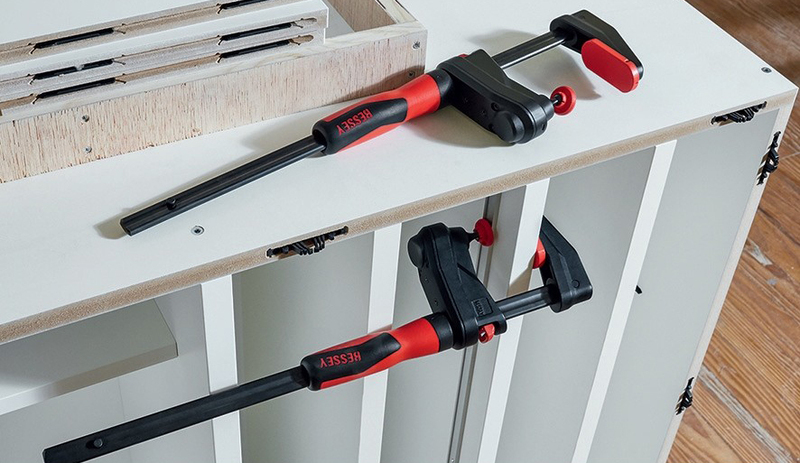 Bessey’s GearKlamp does the work of a standard F-style clamp—in places most typical clamps can’t access. With its patented bar-mounted handle and internal gear mechanism, GearKlamp provides added clearance, so you can work in confined areas. Coming soon to KMS Tools! 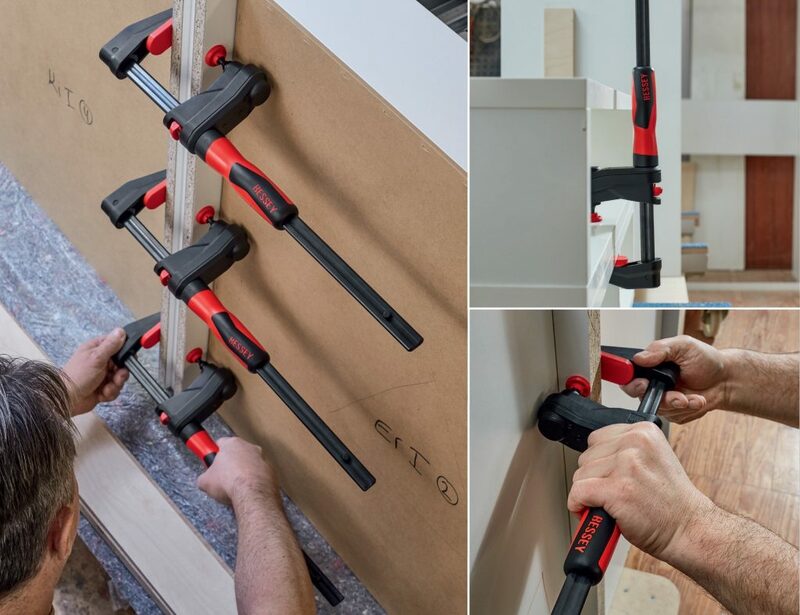 When using conventional F-style screw clamps, handles can get in the way, limiting access to narrow spaces and preventing you from placing the clamp in the right spot. Also, when clamping near an adjacent surface, it’s not always possible to get a proper grip on the handle. This reduces the amount of force you can apply. With a standard F-style clamp (right), the handle can limit access. 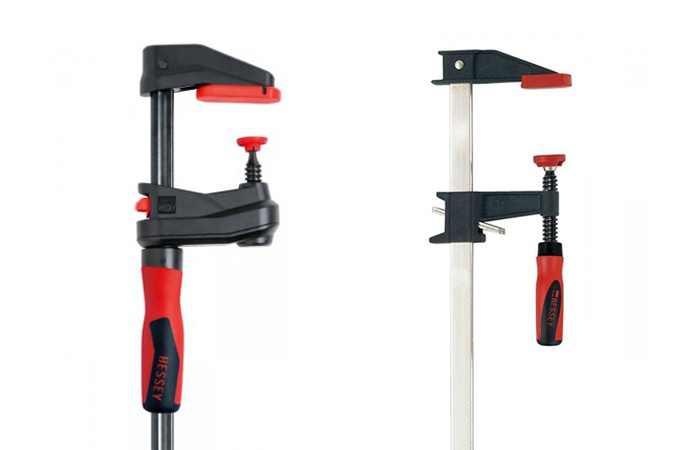 With the Bessey GearKlamp (left), the handle is built over the bar, adding clearance and allowing a better grip. Not so with GearKlamp. Because its handle is built over the bar, it remains outside your workspace. So you can position GearKlamp close to adjacent surfaces or in narrow, partially enclosed areas and apply its full clamping force with ease. This is possible with GearKlamp’s patented gear-actuated clamping spindle. When you turn the handle, the gears adjust the spindle at the end of the arm, and the self-aligning pressure pad swivels into position. The correct position. 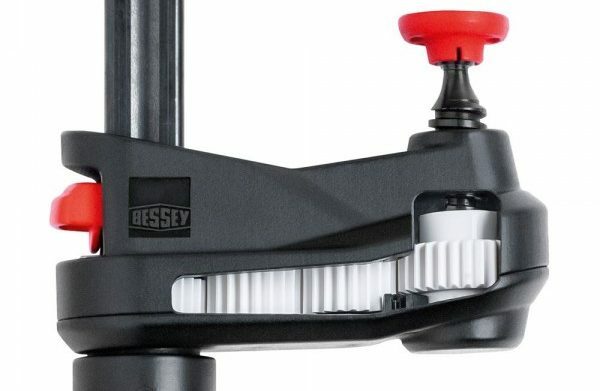 A unique clamping solution for close-quarters and confined spaces, Bessey GearKlamp delivers fast action and secure clamping force up to 450 lbs. 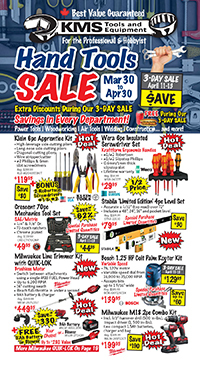 This entry was posted in Archives, New Tools, Woodworking and tagged Bessey, main_page, new tools, Woodworking by Your Friends in the Tool Business. Bookmark the permalink. Next → Next post: Gift Card Giveaway Contest Winner!